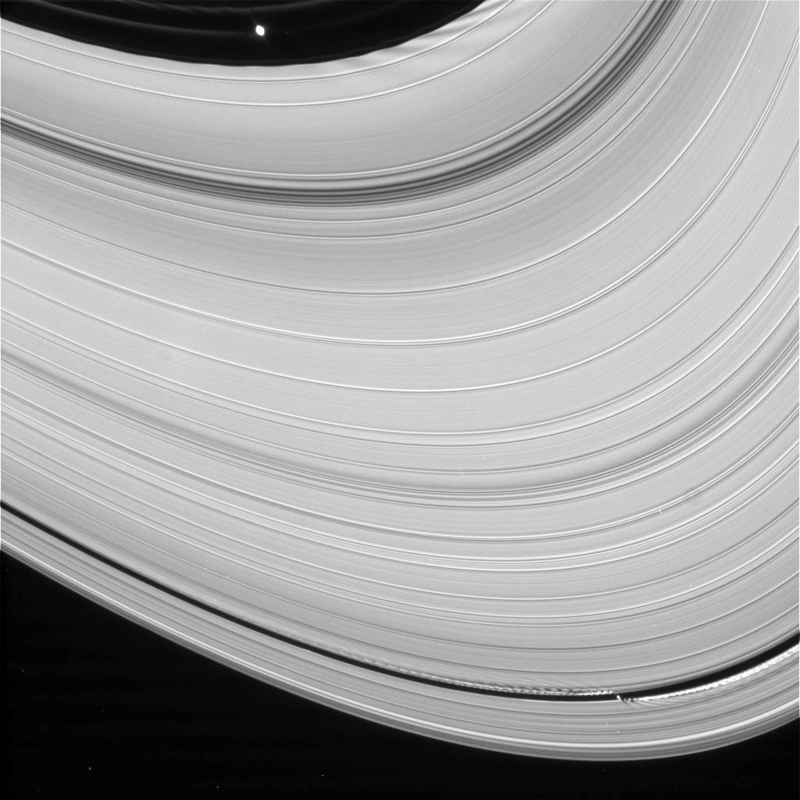 This has to be one of the coolest images yet of one of my favorite subjects: Saturn’s moon Daphnis casting a shadow and riling up the rings as it travels along the 26-mile-wide Keeler Gap, a channel it keeps clear around the outer edge of the A ring. The image above is a cropped and rotated version of a raw image sent back from the Cassini spacecraft today. The four-and-a-half mile wide Daphnis was first seen by Cassini in 2005. As it travels, its gravity “sculpts” the fine, icy particles along the edge of the gap into scallops, not only horizontally but also vertically, sending waves of ring bits as high as a mile or so above and below the ringplane. This phenomenon became clear as Saturn approached its spring equinox last August, when light from the sun hit the planet parallel to the equator and made small details like this visible because of the shadows they cast. Even now, almost a year later, the angle of the sunlight is still low enough to keep the shadows long…Saturn’s year is 29 Earth years long so it takes much longer than a few months to get from spring to summer. The original raw image (below) had another treat as well: the larger shepherd moon Pan was also casting its shadow and causing some gravitational streamers of its own along its path in the Encke Gap! Two dynamic moons in one image…ladies and gentlemen, this is Cassini at its best! Next Post Happy SUN Day, April 17th!